I love Valentine's Day. I know it's cheesy and over-commercialized, but I love a day set aside to shower that special someone with love! I'm also a big fan of the color pink, chocolate, and flowers, so Valentine's Day is like the perfect storm. I also love crafting, Martha Stewart and throwing a party...thus Crafternoon. Last year, I had my first Valentine's Day Crafternoon (Part 1 and Part 2), which included finger foods. This year, I realized that it would be easier and less expensive to make a light lunch. This salad is my all-time favorite salad. So fresh and crisp! Nothing says Valentine's Day like Strawberries covered (or in this case drizzled) with chocolate. 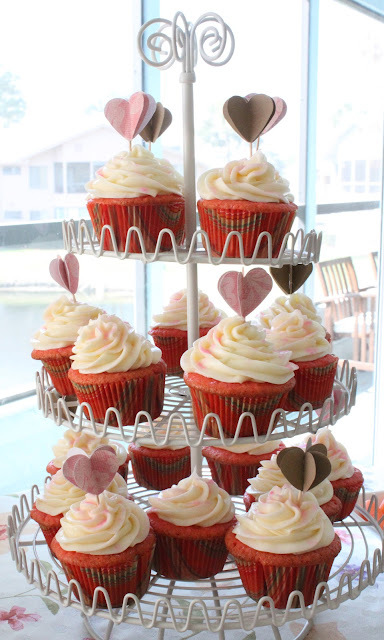 And of course cupcakes. The heart-shaped toppers, in my unbiased opinion, were super cute! I just finished reading "Community and Growth" by Jean Vanier, and I wanted to share with you one of my favorite quotes from the book...I think its appropriate given the season, as well as the life and love we are called to share with others. "We are all called to do, not extraordinary things, but very ordinary things, with an extraordinary love that flows from the heart of God." What are some of the ordinary things you do to reveal your extraordinary love? I love your cupcake toppers! their AMAZING!